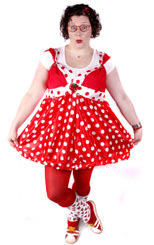 Holly offers oodles of options and themes. 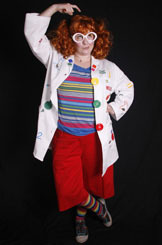 Holly as Strawberry entertains with comedy magic, balloon creations, games, circus skills and face painting. Perfect for parties of ages 3 to 10 years. 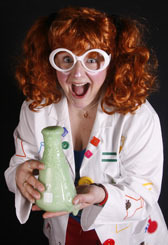 Holly as Betty Boffin the Scientist hosts a hands-on party with science experiments for all to try, including a rocket launch, slime making, tornado racing, bouncy ball making, chemical reactions and lots more. Perfect for ages 5+. Holly as Fairy Cakes is a bright blue fairy with bags of sparkles and magic tricks, she helps your party guests make a magic wand and tiara or wizard wand and hats, will teach children magic tricks in a magic lesson, or aid them in baking their own fairy cakes (oven to be available for use for the cupcake option, and an extra fee of £2 per cake ingredients per child). Holly can also do circus workshops. 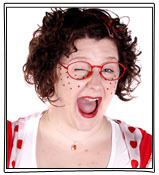 She's super-talented, super-fun and based in Dorset.